Earlier this summer, I wrote that I had finished a master word list. 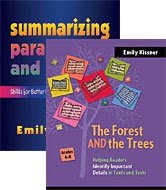 This list of over 1000 words includes words from the Academic Word List, the Fry list, and the Common Core, organized with data such as syllables, syllable types, word roots, idioms, and multiple meanings. I've been using this list for various purposes throughout the summer--generating spelling lists, looking for important vocabulary words, and finding word roots. If you'd like a copy, please let me know. 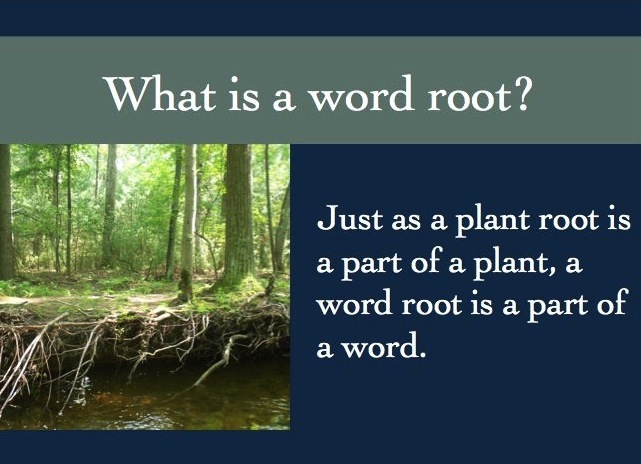 The third spelling list is focused on word roots. I want to teach these early so that we can continue looking at patterns of meaning throughout the year. 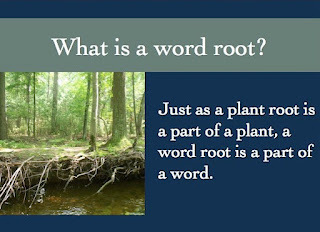 To help kids understand what word roots are, I created a simple Powerpoint presentation. It will be free on TeachersPayTeachers until August 30. 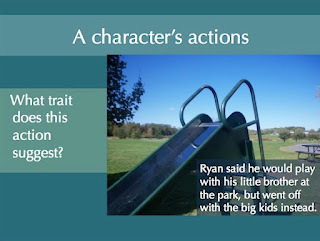 I also want to start looking at character traits very early in the school year. I made this presentation to show students what character traits are and how we can find them through exposition, dialogue, and actions. I wanted to make sure that the presentation includes differentiated practice--there are some questions that all kids will be able to answer, and others that offer more of a challenge. Again, this will be free until August 30. I love using Readers Theatre in my classroom. It's so much fun to watch the students show off their dramatic talents with zany, information-filled plays. Unfortunately, I've become very picky about scripts. I don't want scripts that are more than 3 pages long, because no fourth grade audience has they attention span to watch the performance. I don't like scripts with more than 6 characters, because the groups often start fighting. I go through all of the scripts in this book in about two months. To build my script base, I have written several sets of scripts to go along with what I am teaching. These scripts are all roughly the same length, with about the same number of parts. Once we perform a set, extra scripts are kept in one spot in the classroom for students to use during free time and indoor recess. These scripts do not come easily. Coming up with a situation, explaining a topic, and making sure that each character has a decent set of lines is hard to manage. Making it all fit on 2-3 pages is even harder! I can usually only manage it every few months or so. Interestingly, it's not something I spread out, like the text structure packets; instead, I write these in an intensely concentrated period of time. Five scripts (character, setting, plot, theme, conflict) review the key story elements, with varying degrees of silliness. Four scripts (chronological order, compare and contrast, problem/solution, and cause/effect) explain text structures. Three scripts explain why readers choose books. I have always meant to add a fourth script to this set, but every time I sit down to do it my brain just--refuses. Five scripts explain the differences between mammals, reptiles, amphibians, fish, and birds. Scientific Method Readers Theatre (whole class): This one isn't my favorite, but it makes for a fabulous substitute lesson. I'm in the middle of classroom preparation right now, trying to balance the fun tasks--setting out the classroom library, making posters, and planning lessons--with the more mundane tasks of schedules and seating charts. As I was trying to tidy up my files, I found some pictures that I had made last spring. I created these while my own children drew at the dining room table, photographed them, and forgotten about them. With a little enhancing, they turned out to look pretty neat. But these were drawn for a purpose. I start each school year by talking with students about different kinds of text--informational, persuasive, poetic, and narrative. Years ago I had made some basic black and white texts for students to sort into a 4-frame graphic organizer. Kids always enjoy working with the tiny little books, and love being able to make their own. This spring, I decided to make the task a little more glamorous by creating some colorful pictures. And I would have forgotten all about it if I hadn't been cleaning up my files! There is probably some lesson there about the virtues of cleaning up, but I will pretend that I have not learned it. You can find some lessons and activities to go along with the mini-books here. The rest of the mini-books are embedded below. Follow the link to Slideshare, where you can download them. Just let me know if you use them and what you do with them. I invest a great deal of time thinking about the classroom. And I want kids to be as invested in the classroom as possible. Imagine my disappointment, then, when I've had students ask, "What subject is this?" Moving from science to social studies to writing in one classroom in one morning makes for a whirlwind time. The topics that I can keep so clearly delineated in my head tend to all blur together for students. As I plan for the coming school year, then, one of my important questions to consider is, "How can I make sure that kids are invested?" I want kids to do more than just go through the motions. I want them to know what subject it is! Here are two things that I plan to do this year. I started using this again in the middle of last year, shortly after the "What subject is this?" incident. 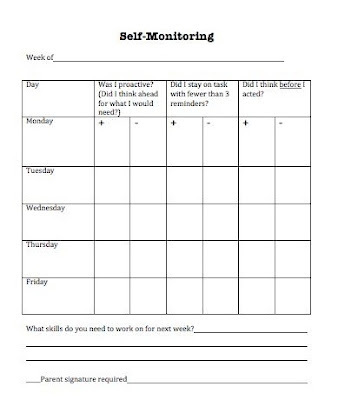 This is a great tool to use to keep everyone on track. With the Weekly Bulletin, I plan out the essential questions and assignments for the week. Students get their own copies of the Weekly Bulletin. This way, everyone knows the essential questions and what they need to accomplish. Is it hard to create? Well, yes and no. 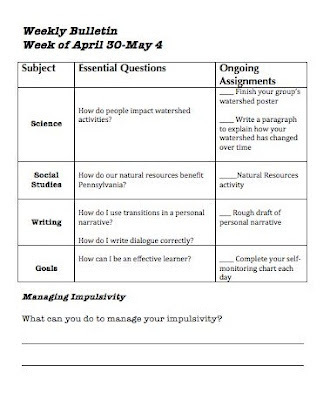 On the example, you'll notice that my Weekly Bulletin only covers the classes that I teach to my homeroom--science, social studies, and writing. Too many subjects can be overwhelming for kids (and teachers!) From a planning viewpoint, the Weekly Bulletin forces me to think about the upcoming week in advance and get everything ready. Definitely a good thing! Morning and dismissal work becomes much easier. Students know to consult their Weekly Bulletins to look at what they should be doing. Instead of making extra work for students to do during these times, I can keep them working on our regular curriculum. 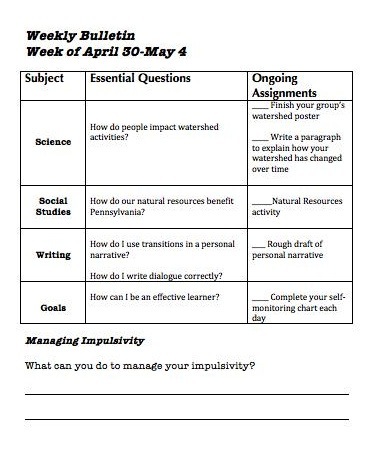 With the Weekly Bulletin, I was able to accomplish at least one writing prompt per week in the content areas. 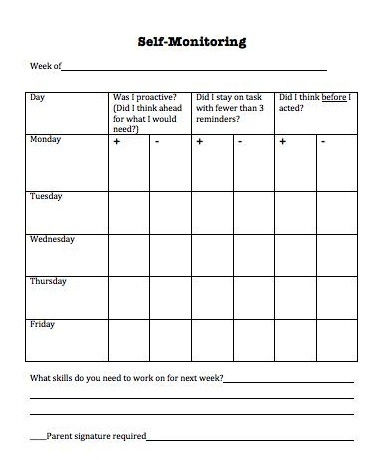 Another goal that I have is to help students pay attention to their own behavior. Can they make good choices? Are they able to see the patterns of their behavior across the day? I made a simple self-monitoring chart to help them consider this. When there are problems in the day, I ask the students to record the issues themselves. This helps them to see what is happening and take responsibility for their actions. It works well for smaller issues (forgetting a pencil = not being proactive) and bigger issues (unkind words on the playground = not thinking before acting). I sometimes observe kids putting tallies on their sheets without my prompting, both positive and negative. This kind of thinking shows that students are taking notice of what goes on. I change the goals at the top frequently to reflect what is happening in the classroom. Sometimes students even make suggestions for what to add there. These two tools help students to understand what is going on in the classroom--and become more invested in our daily routines and activities.